UPPER WEST SIDE — Bex Schwartz's dad was a hippie who dreamed of getting married in Central Park. His fiancee's parents had more traditional ideas and the couple ended up being wed in a Poughkeepsie synagogue in 1970. More than 40 years later, Schwartz is giving 24 gay couples her father's nuptial dream. 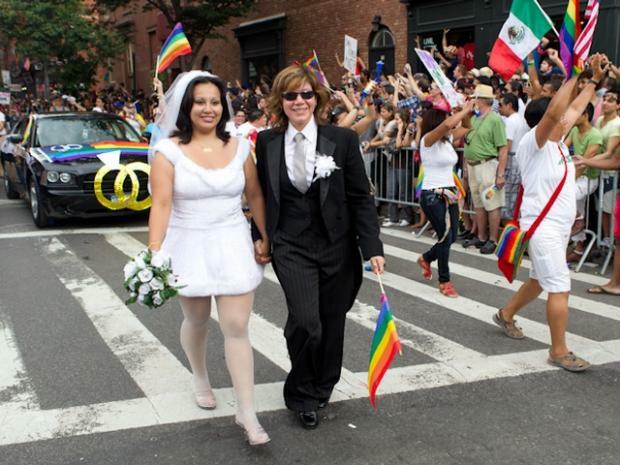 She's organized a free wedding bonanza for the lucky chosen gay couples on July 30 at Merchants' Gate, Central Park's entrance at Columbus Circle. At two "pop up chapels," selected couples will get 15-minute personalized wedding ceremonies with the works — complete with an officiant, photographer, flowers, champagne and an aisle to walk down. The couples, who were chosen through their applications on Schwartz' website, are responsible for getting their own marriage license from the city. Schwartz, a 32-year-old Chelsea resident who's not married herself, came up with the pop-up chapel idea in a celebratory haze following the June 24 legalization of gay marriage in New York. Schwartz and some friends thought they could whip up some cupcakes and hold hundreds of free weddings at Bethesda Fountain. The Parks Department suggested a smaller group at Merchants' Gate instead. Schwartz and company set up a quick website, and were overwhelmed by the response. First, volunteers and businesses contacted them wanting to help out. Then they heard from hundreds of couples looking to get hitched at the iconic New York locale. They chose the lucky couples on a first-come, first-serve basis, and now have a long waiting list to draw from. Sponsors for the wedding-a-thon, which will go on from 10 a.m. until dusk, nclude The Knot, Just About Married, David Stark Design, CityCakes and Architizer, an online architectural community that's holding a competition to design the pop-up chapels. There will be a spectators' area so people can watch the weddings. Schwartz's dad, Bob, will be among the volunteers helping to usher the couples into wedded bliss. Schwartz said she wants the 24 couples to "feel the love and joy from the city of New York."